Yes, this is Chippy. He’s a chipmunk. He’s lived here for years. 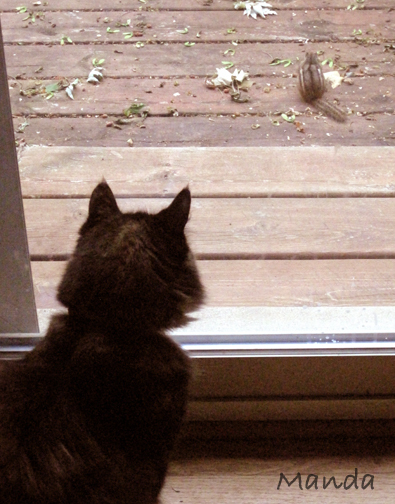 Well, okay, as an adult, I realize that this particular chipmunk probably hasn’t been here for 10 years. But, I think his ancestors leave very detailed notes on the best places to build nests and how to have fun with our kitty. My MOPS group had a Master Gardener come and talk to us. I asked her how to keep the chipmunks out of the flower beds. She was real cute. She started with, “You get a bucket……. and fill it half way with water.” I was on to her by then but many of my fellow moms looked on in confused curiosity. “Then, you’ll need a plank of wood.” LOL! I was already laughing. Kind of making the little guy walk the plank, right mateys? I guess they climb in and can’t get out. 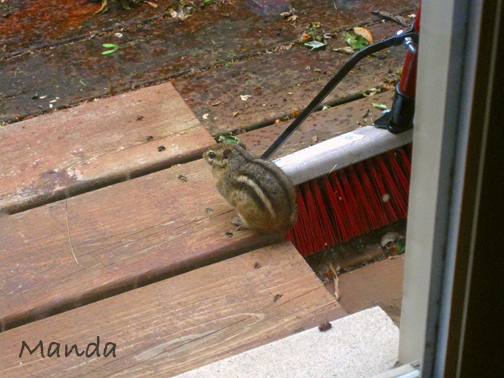 So, drowned chipmunk solves the problem with no pesticides. Except, I knew that this totally would not fly with G, my almost 8 year old, who named Chippy and frequently looks for him to make sure he’s okay. The other suggestion was putting red pepper flakes in the flower garden. They supposedly don’t like them. I’m yet to try it out. 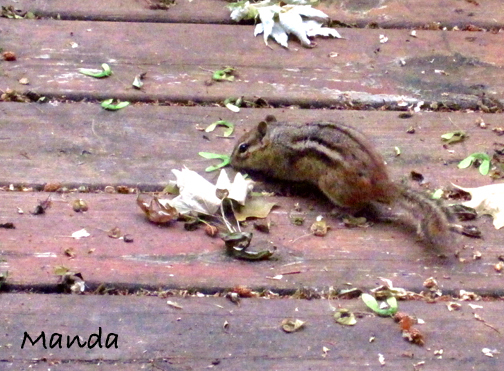 So, for now, Chippy gets to torment the cat and dig holes in the flower box. Lil’ Stinker. PreviousSeason Goes Out with a Bang!